Have You Saved a Life Lately? Give Blood! It’s This’n’That Thursday, a blog hop hosted by 2 Brown Dawgs and Ruckus the Eskie! Hop along! Have you saved a life lately? How exactly does one save a life? I’m sure there are plenty of ways to save a life. Rescue a drowning person. CPR. Emergency surgery if you’re a doctor or medical professional. Donate money to a cancer or other medical fund. Stop at an accident scene. Call 911. Inject an epi pen. 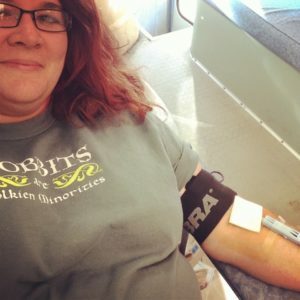 Do you give blood? Yes, the shirt says HOBBITS are Tolkien Minorities. I’m not very good at saving lives most days. But about every three months I like to go give blood through the Red Cross. And giving is easy, but not everyone can do it. Can you? Sometimes my iron is too low and they send me home. I wonder if I should acquire a taste for the Jones Beef Liver Taffy, since liver is a great source of iron? This was me giving blood at the mall this summer, bringing my total at the time to three gallons! 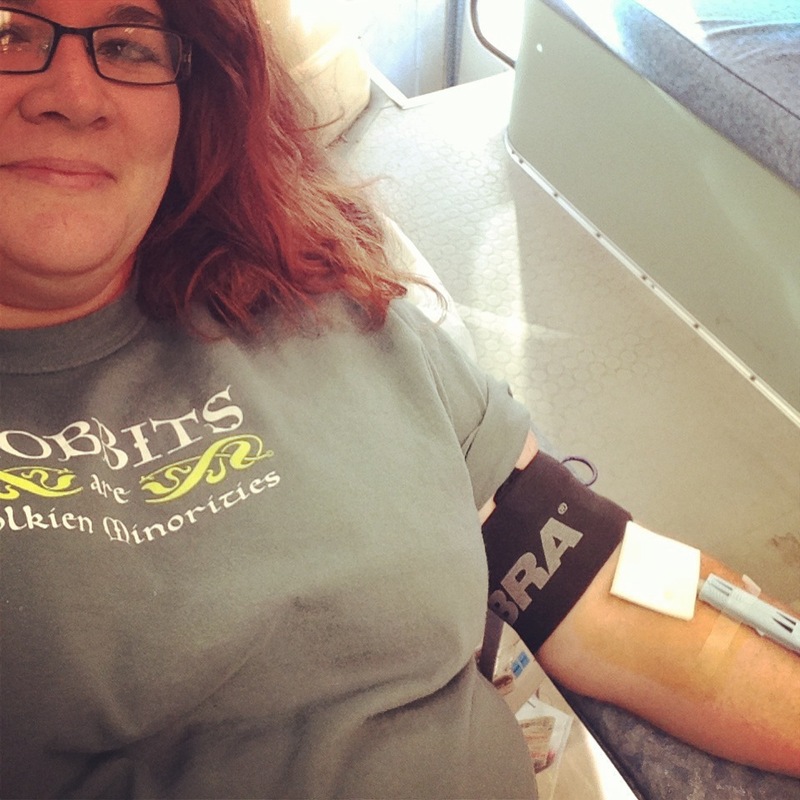 One pint saves three lives. The Red Cross likes my blood, since I’m AB+, a universal recipient. So If I’m in dire need, pretty much any blood will do. Or something like that. 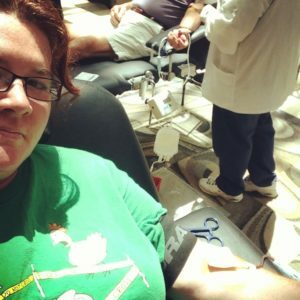 Y’all, giving blood is one of the safest procedures there is. The techs ask a million and one questions. There’s a book to read before you give. You can’t give if a variety of things apply to you – certain medications, trips out of the country, blood transfusions within a certain time frame, piercings and tattoos in 12 months time. All kinds of things. But plenty of people CAN give. And there’s juice and cookies! Imagine my disappointment when, once I’d done having children and could give again, there were no more Little Debbie oatmeal creme pies. That’s like telling my dogs to do tricks and giving them Milkbones instead of Jones Chicken Taffy. It’s just WRONG. I give anyway. I love it. You should try it, too. Give blood. Save a life. Oh! Have you entered yesterday’s giveaway? DO IT NOW! All you need to do is comment on the post. The book I’m giving away was a very good read!